Never shall I forget that smoke. Never shall I forget the little faces of the children, whose bodies I saw turned into wreaths of smoke beneath a silent blue sky. Elie Wiesel, a Holocaust survivor and author who fought for peace and human rights died on July 2nd, 2016 at the age of 87. While everyone will remember his fight for human decency, I would like to remember his work through the eyes of my World Literature students. 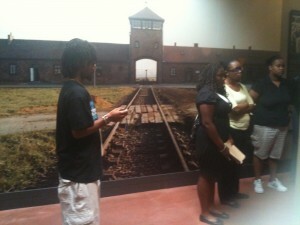 Up until 8 years ago, I had never taught the text, Night, nor had I extensively covered the Jewish Holocaust, but as fate would have it, my principal moved me to World Literature and now I was “tasked” with not only covering the text but making it interesting to my classroom full of students in inner-city students in Atlanta. I knew they needed to learn about this horrible time in the world, but I had to figure out a way to engage my students. After scouring numerous used bookstores, I finally had my companion text, Left to Tell by Immaculee Illbiszaga. I wish I could say my students were uber excited to learn about world events, but in a time when most students were more concerned with Facebook statuses than social justice, I decided to take a road less traveled and I decided to shock them into caring. I opened up the unit with two pictures- decades apart but told similar sufferings and before I allowed the students to say anything they had to annotate the pictures for meanings. So, the first day of the new unit in October, I projected two screens (side by side) in my classroom and for the warm-up students had to annotate the pictures for meanings. 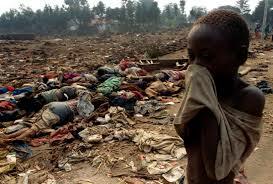 The aftermath of bodies after the Rwandan Genocide. 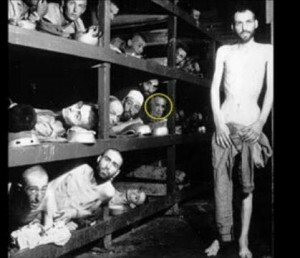 Elie Wiesel at Auschwitz as a teenager. I used this opportunity to give them a little bit of background of the photos but explained to them that our unit would focus on two central texts by Illbizaga and Wiesel and before we did anything else we would need to understand the word genocide. violent crimes committed against groups with the intent to destroy the existence of the group. Human rights, as laid out in the US Bill of Rights or the 1948 United Nations Universal Declaration of Human Rights, concern the rights of individuals. This definition brought a lot more questions as my students wanted to know so I divided the students into pairs and using the standard 10RL1 (Citing Textual Evidence) I gave students the article, “Redefining Genocide” and they had to annotate and answer six text-dependent questions that would make them go “deep” into why the term was coined. Once all students understood the definition and had a good understanding of the article on Redefining Genocide, I then allowed the students to go further into citing textual evidence and research, I gave students a hodgepodge of articles about various genocides and had them complete a WebQuest on their finding(s). WebQuests Note: These WebQuests are just starting points. Revise them as you need to cover the standards of your unit. During this phase of about a week, the classroom would get very “heavy” with emotion as we research, discuss, and process the worse of human nature. Students ask questions some days and other days they just want to “get done”. 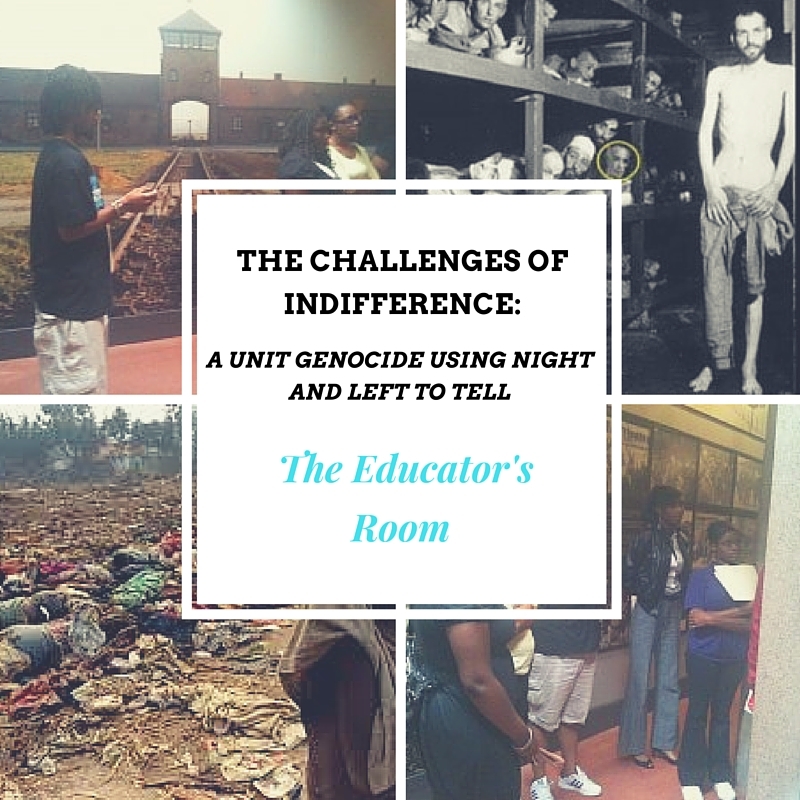 No matter how the kids feel, I always bring the research with the same question- How did indifference make the (insert genocide name) possible? By the time students are finished, they are ready for the next level of learning- reading the text(s). Traditionally, I always started with the Rwandan Genocide text, Left to Tell, because it’s easier to read and students move through it quickly. Taking a page from my elementary and middle school counterparts, I always read the preface of the text, Left to Tell word for word and by the time I finished kids were on the edge of their seat with anticipation. Was she a Hutu or Tutsi? Why is she in a closet? Since I had them hooked, I then gave them a structured reading schedule and for the next month, we used this text to teach the standards 10RI1-3. While our days were busy reading the selected texts, I arranged field trips and guest speakers to help my students understand that genocide is real. While we were 4 weeks into the unit, we had transitioned from Left to Tell to Night and my students were more than curious about Mr. Wiesel’s story. I used a multitude of resources found at the Jewish Holocaust Museum and The Breman Jewish Heritage Museum for my kids to meet real survivors of the Holocaust. 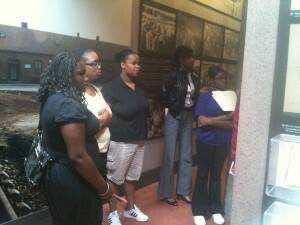 Our first field trip to the later, my students were silent as they respectively observed the artifacts. To top things off we had the pleasure of listening to a survivor tell their story and answer questions for the students. The conversations that this person shared with us was immeasurable and brought my students to tears. This just a glimpse of what I did during this nine-week unit but what my students learned will be with them for a lifetime. As a matter of fact, when news broke the Mr. Wisel had passed one of my former students sent me the following text message. I had succeeded, my students understood that indifference is just as evil as murder.